Populations are dynamic: density, age structure, survival, and reproduction fluctuate over time. A paradigm of modern ecology is that populations are regulated by density-dependent processes, but the debate over the function of both density-dependent and independent processes still rages. The ability to test for population regulation is strengthened by the length of the time-series data. The demographic study of the Florida Scrub-Jay (Aphelocoma coerulescens) at Archbold Biological Station, begun by Glen E. Woolfenden in 1969 and continuing today, is among the longest and most complete studies of birds. For more than forty years we have documented the fluctuations of this population (Fig. 1): we find every nest, band every bird, and map every territory. Each month, we census every bird in the population and each year, we search peripheral habitats for birds that have dispersed from the main study area. These relatively simple methods enable us to calculate all aspects of the demography of this cooperatively-breeding species and compile complete lifetime histories on thousands of individuals spanned many generations. Fire is the primary ecological disturbance that maintains the habitat structure essential to the long-term persistence of the jay. 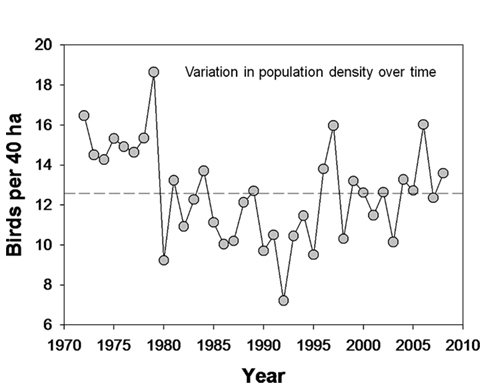 In the absence of fire, jay populations decline and eventually disappear; when post-fire conditions are ideal, jay density is highest (Fig. 2). 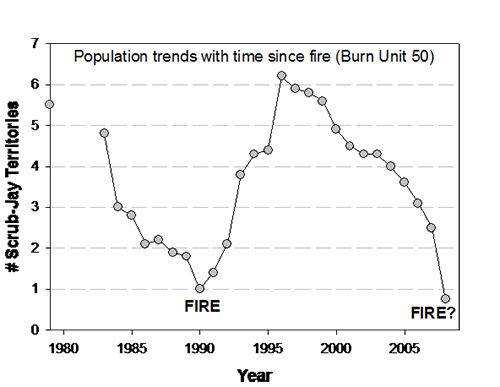 Both the spatial pattern and intensity of fire has been mapped for nearly the entire duration of the demographic study. We also have detailed maps of the various vegetation associations that comprise the habitat of the Florida Scrub-Jay and comprehensive records of local weather and climatic variables that likely influence the annual cycle of the jays. In recent decades, we have quantified resources, such as arthropods and acorns, which add spatial and temporal variability to the jays’ demographic patterns. Our primary goal is to document and explain the processes and ecological interactions that shape demographic variation. Our demographic data spans >10 generations and the pedigree provides an enormously powerful tool to examine the extrinsic and intrinsic factors that either limit or regulate this population over time and across space. We are currently examining how factors such as climate and weather conditions, resource availability, and social interactions affect the demography of Florida Scrub-Jays and whether these factors are density-dependent. We are developing stage-specific survival models to explain how different age and social classes respond to different environmental conditions and to the dynamic interactions among these forces, such as how weather may influence resources, which in turn may influence individual susceptibility to disease, leading to widespread epidemics. All of these analyses can be overlaid against a pattern of pyro-diversity: variation in fire return intervals. With the pedigree, we are adding lineage effects for life history traits that might be heritable and influence demography (such as time of breeding or clutch size), allowing us to distinguish among additive genetic and environmental affects. We also have demographic data on scrub-jay populations that occur in different landscapes. We have over 18 years of data from a nearby suburban population and a population that occurs in a naturally fragmented landscape. Comparative analyses among populations will help elucidate the influence of landscape patterns on demographic variation. have been examining the influence of intensive, species-specific management on the demography and population structure of Red-cockaded Woodpeckers (Picoides borealis). Also at APAFR, we have been conducting annual point counts of a population of the Florida subspecies of Grasshopper Sparrow (Ammodramus savannarum floridanus) that has undergone a significant population bottleneck, from a population of over 200 to fewer than 5 breeding pairs in just a few years. Here we seek to understand the potential causes of this decline and solutions to its recovery.